We are excited to offer you some amazing, critically acclaimed cruises hosted by Gerry, Rosie, Mick and Deanna Wilson! Class: They focus on the details to make your trip amazing. Less Crowds: Tired of the super-ships where you are one in 2500? On AMA Waterways you are 1 in 150. There is plenty of room as well. Five Star Ships: Luxury, comfort and elegance. Incredible Crew: High crew ratio (crew to passenger ratio), and they are extremely hospitable. You won’t be nickel and dimed: Many of the onboard expenses are included. You won’t be taken. Fun: Going through Europe on the life of the rivers! WOW! Personalized cruise planning: Our winery travel agent is amazing as well as those on the cruise lines who help you plan and organize your trip. Onboard wine tasting, wine dinners and wine classes with Rosie and Gerry Wilson. 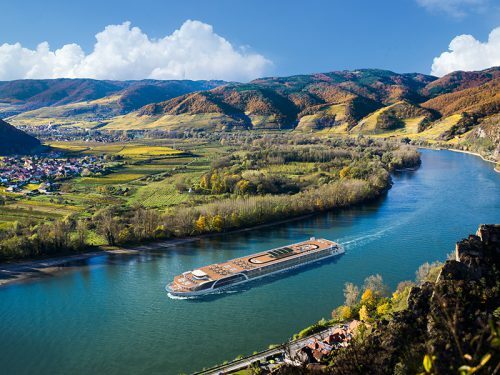 The Wilson’s will be wine hosts for AMAWATERWAYS Munich or Prague to Budapest. Open for booking now! Discounts available for booking early, up to $400. Wine club members get an additional discount as well. Contact our winery travel agent, Betsy Scherr, at 541-385-0499 for more information.